DC Office Biswanath Recruitment 2017- 24 Nos. Librarian, Grade III & Grade IV Posts: Last Date 26-05-2017. - Jobs4NE : Jobs in Assam and North East India. 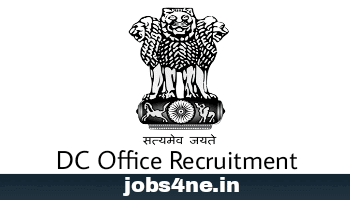 DC Office Biswanath Recruitment 2017- 24 Nos. Librarian, Grade III & Grade IV Posts: Last Date 26-05-2017. In pursuance of the communication received from the Director of Higher Education, Assam, Kahilipara, Guwahati-19 Vide No. PC/HE/Plan/13/2016/5/ dtd. 25/04/2017, the Deputy Commissioner Biswanath District in the capacity of Chairman of Governing Body of Deendayal Upadhyaya Adarsha Mahavidyalaya at Behali invites applications from Indian Nationals having proficiency in’ local language for the post of Librarian, Grade III & Grade IV as detailed below. Eligible candidates may submit applications to the address given within stipulated date and time. Last Date of application: 26-05-2017 till 5 pm. Total no. of posts: 24 Nos. 2. Asstt. Librarian: 1 (UR). 3. Library Asstt. : 1 (OBC/MOBC). 4. Sr. Asstt: 1 (UR), 1 (OBC/MOBC). 5. Jr. Asstt: 2 (UR), 1 ( STP). 6. Lib. Bearer: 1 (UR). 7. Lab Bearer: 3 (UR), 2 (OBC/MOBC), 1 (SC), 1 (STP), 1 (STH). 8. Gr. IV: 3 (UR), 1 (OBC/MOBC), 1 (STP). 9. Chowkidar: 1 (UR), 1 (OBC/MOBC). Age Limit: Age of the candidate should not be more than 43 years as on 01 /01 /2017. 5 (five) years relaxation for SC/ST category. 1. Librarian: Master of Lib. Science from any recognized University. 2. Asstt. Librarian: Bachelor of Lib. Science from any recognized University. 3. Library Asstt./ Sr. Asstt./ Jr. Asstt. : Graduate in Arts/ Science/ Commerce with knowledge of Computer typing and simple Excel with Diploma/ Certificate of computer knowledge for minimum 3 months duration. 4. Lib. Bearer/ Lab Bearer: H.S.L.C. passed from any recognized Board. 5. Gr. IV - H.S.L.C. passed from any recognized Board. 6. Chowkidar- H.S.L.C. passed from any recognized Board. 8. Chowkidar : Rs. 4560-15000/- + GP 1500/-. Place of Posting: Deendayal Upadhyaya Adarsha Mahavidyalaya, Behali, Biswanath. Application fee: Rs. 100.00 to be deposited d in the form of Demand draft in the name of Deputy Commissioner, Biswanath District. How to apply: Application In Standard From to be delivered in the Deputy Commissioner’s Office, Biswanath.